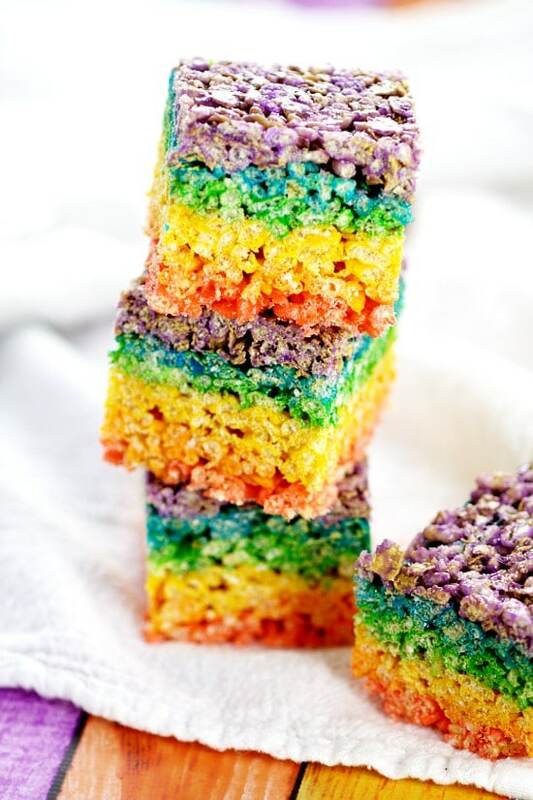 Easy, no bake Rainbow Rice Krispie Treats make a pretty and festive treat for St Patrick’s Day, or even just for fun, that everyone will love! 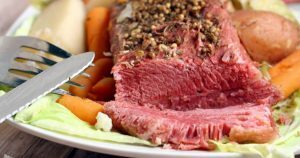 If you’re looking for a fun but simple treat for St Patrick’s Day, look no further. 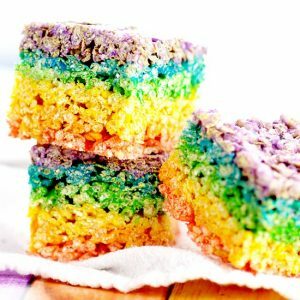 These Rainbow Rice Krispie Treats require absolutely no baking, take less than 30 minutes to make, and turn out super cute. The kids loved them, and I did too! Rainbows make everything so pretty! has all the colors you need and then some. 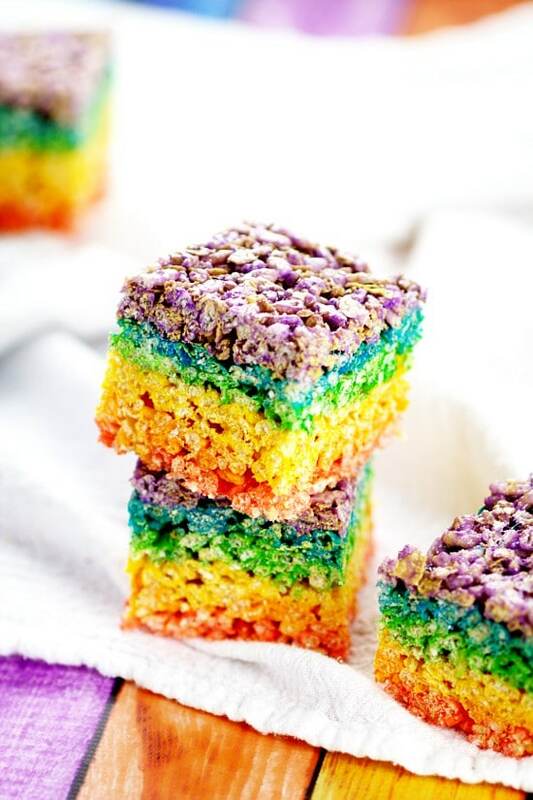 Easy, no bake Rainbow Rice Krispie Treats make a pretty and festive treat for St Patrick's Day, or even just for fun, that everyone will love! Butter the inside of a 9"x13" baking dish. Microwave on high for 1.5-2 minutes, until butter is melted and marshmallows are soft. Add your first food color (I used the traditional rainbow order: red, orange, yellow, green, blue, purple) and whisk together quickly. 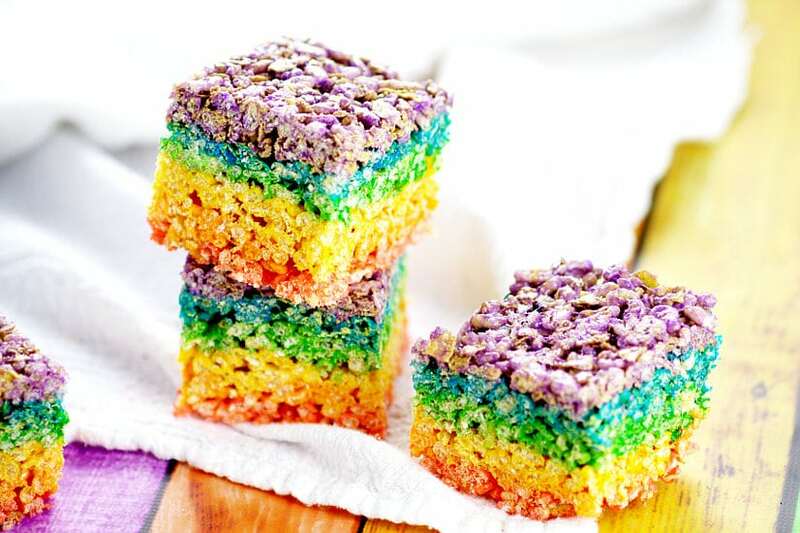 Did you like this Rainbow Rice Krispie Treats recipe? 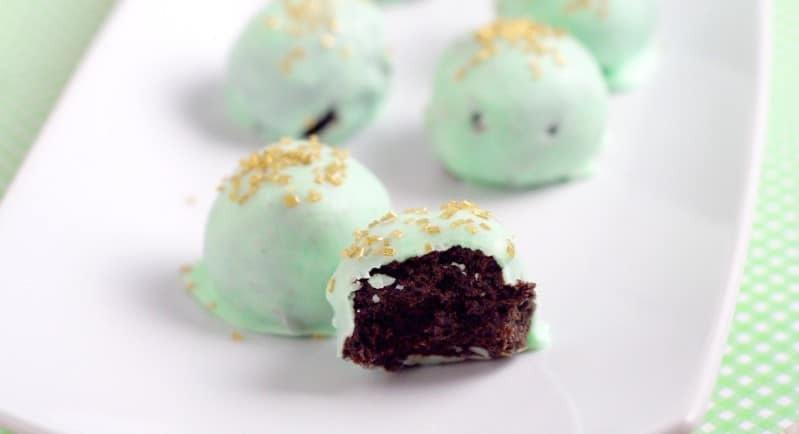 Find more on my Desserts and St Patrick’s Day boards on Pinterest! 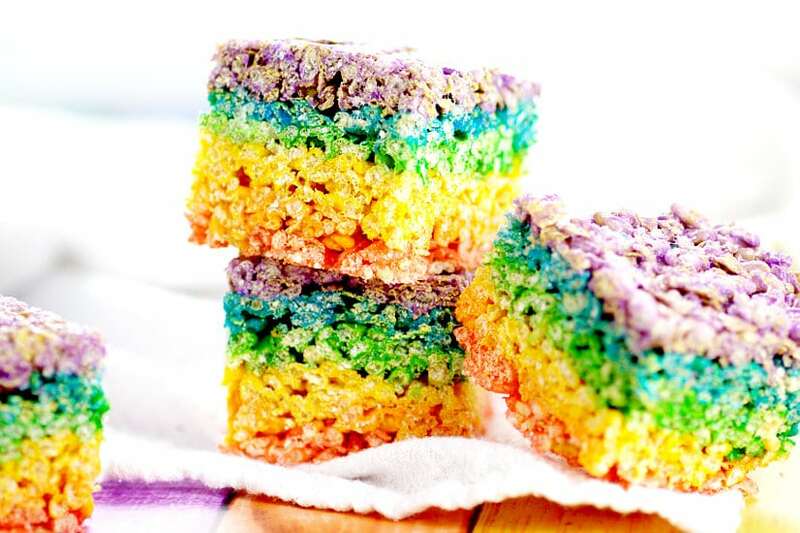 these are amazing and I know 2 little kids who would LOVE to eat the rainbow! So colorful! Great for St. Patrick’s Day and summer! I love your treats! So fun! Thanks for linking up with me for Friday Favorites. I’m featuring you this week! I’m so sorry! Thanks for pointing that out. It should 1 1/2 cups each time, to make 9 cups total! I fixed the recipe now. I made these today as a tester to use at my wedding sweety table next august and they look amazing! I ve left them in the fridge for about 4 hours but they are still abit sticky, I m worried about cutting them incase they fall apart. Are they suppose to remain sticky or go abit harder? Not sure if I messed up somehow! Hi, I am planning to make this recipe for a birthday party next week. Can you tell how many boxes of cereal did you use for 12 cups? An also How many bags of mini Marshmallows?? 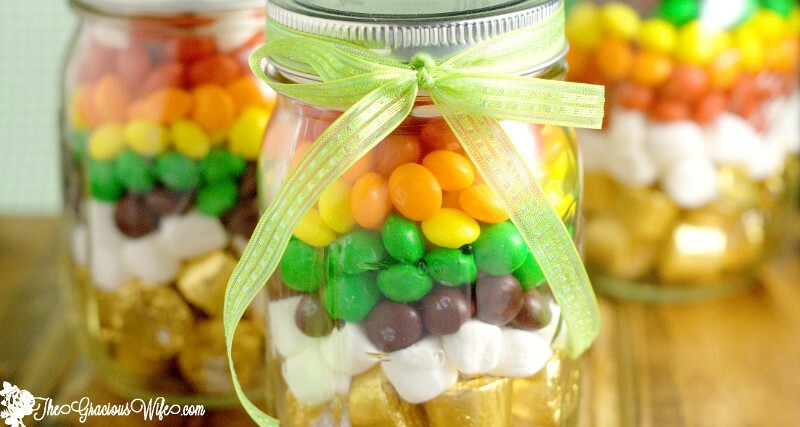 You’ll need 2 bags of marshmallows, too. There’s about 6 cups in a normal sized bag. I remember it being a little over 1 box, so definitely grab 2.